A compact keyboard that doesn’t compromise, HyperX’s Alloy FPS is a good option for many now that it’s got new CherryMX key switch options. Ultra-clicky blue switches aren’t the only option for HyperX’s Alloy FPS mechanical gaming keyboard: The company now offers CherryMX brown and red switches on its flagship keyboard. The HyperX Alloy is a sleek, sturdy keyboard that maintains a compact profile without removing the ten-key numpad. Portability is maintained without compromising key features, keeping everything essential on deck in a neat package. With a detachable USB cable and a soft and squishy carrying case, the HyperX Alloy was designed with professional players in mind, as their schedule demands plenty of travel. But it’s not only for professional gamers: The low-profile keyboard won’t look out of place on any desk. And that’s one of its strengths: Simple design removes some of the more gamer-y elements that plague keyboards aimed at esports enthusiasts. There are neither weird nor tacky angles, just clean lines and minimal dead space on the keyboard’s chassis. Though the HyperX Alloy is topped with a “solid steel” frame, the underside is plastic. And it’s sturdy. Regardless of the force used to press its keys, the HyperX Alloy does not feel like it’s going to give. Previously only available with CherryMX blue switches, the HyperX Alloy was loud—some people love that, some folks hate it. HyperX addressed the issue by adding CherryMX brown and red switch options. CherryMX red switches are considered linear and non-tactile. Keystrokes are smooth when pushed, with less force needed to actuate the key. CherryMX red switches are designed to feel smooth and fast. CherryMX brown switches find themselves somewhere between tactile, super clicky CherryMX blues and CherryMX reds. Like the blue switches, brown switches are considered tactile, meaning there’s a slight tactile bump as the key is pushed, giving some audio feedback—but less loud than blues. Both the red and brown switches require less force to actually input each key. Blues are loud for intense gaming, often heard over an in-game microphone. But that’s not necessarily a negative toward the keyboard itself, and more personal preference. If you care about annoying your teammates with incessant clicking, however, then steer clear of blue switches. Neither CherryMX red nor brown switches are completely silent, but they certainly don’t have the super loud clickiness of blue switches. Personal preference will determine if the crispness of blue switches is worth more than the noise. As with any new keyboard, it takes some time to get used to. For us, moving from a non-mechanical laptop keyboard to the HyperX Alloy has been a journey, for sure, but one that’s been worth it. Generally, it’s more comfortable for longer gaming sessions, and there’s a lot of value in having the num-pad while typing. Testing out the CherryMX red switches on the HyperX Alloy, though, means a lot of extra key pushes—and plenty of typos—as a feel for the keyboard is earned, as it takes much less force to a key to be input. Lighting behind the keycaps comes in one color—red—with six different lighting patterns to choose from. Though customization in this regard is lacking, the HyperX Alloy does allow a few different levels of brightness. Changing these modes is easy, if you’ve read the instruction manual. Unlike with Razer products, there’s no additional software needed to adjust the keyboard’s lights. That’s accessible straight from pressing buttons on the keyboard itself. This is a plus for some, and a negative for others. It comes down to your customization needs. If you’re a person who wants control of each and every key’s lighting, look elsewhere. Textured alloy keycaps are included to replace the WASD and 1234 keys, which is a neat little extra feature. 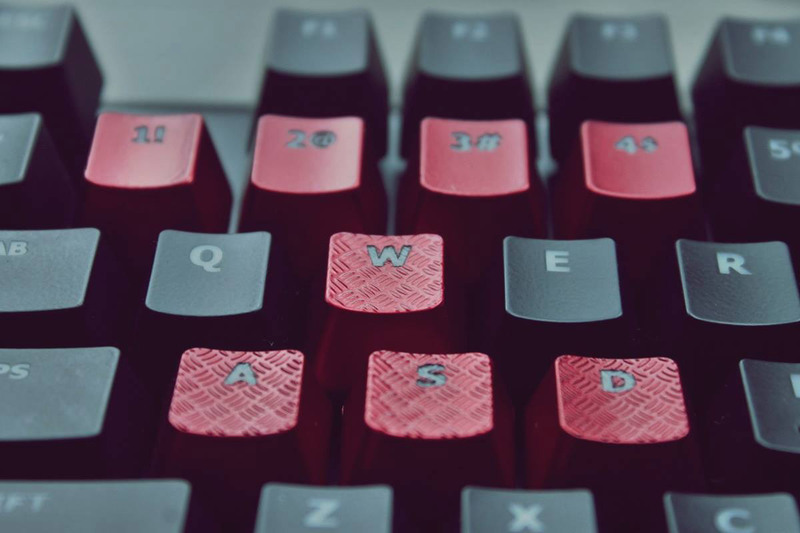 With WASD being the most-used keys in many games, the textured keycaps are a designator that a player is on the right keys without taking eyes off the keyboard. N-key rollover is a standard function of this keyboard, meaning it doesn’t matter how many keys are pushed at one type—each will be recognized. Each key press is input individually by the keyboard so that no presses are missed. It’s a nice function to have on a keyboard where rapid movements mean sometimes hitting another key before the second or third is released. N-key rollover is the highest rating for key rollovers: There is no limit to how many keys can be pushed and registered at one time. There is, however, a game mode that turns off the Windows key so it can’t be accidentally pushed during gaming sessions. The compact form leaves no room for dedicated media keys—for playing music and adjusting volume—and that’s a deal breaker for some folks. It’s not a problem for those who value a clean design over those extra buttons. Media keys are available on the top row, though the function key has to be held down to access them. This is as opposed to something like the Corsair K70 RGB or Logitech G910 Orion Spark keyboards that includes dedicated media keys above the numpad. Dedicated media keys come in handy when multi-tasking. Say, a song you hate comes on while you’re playing Overwatch. A dedicated media key allows you to switch by pushing just one button, while with the shared buttons you’ll have to push two. Manufacturing the HyperX Alloy with only CherryMX blue switches was the keyboard’s biggest downside. Now that CherryMX red and brown switches are available, HyperX has upgraded itself from a good keyboard for some to a great keyboard with options for everyone. Priced at $100 on Amazon, it’s an affordable, solid option. Pros: The HyperX Alloy FPS mechanical keyboard is a compact, sleek keyboard that doesn’t compromise on functionality. 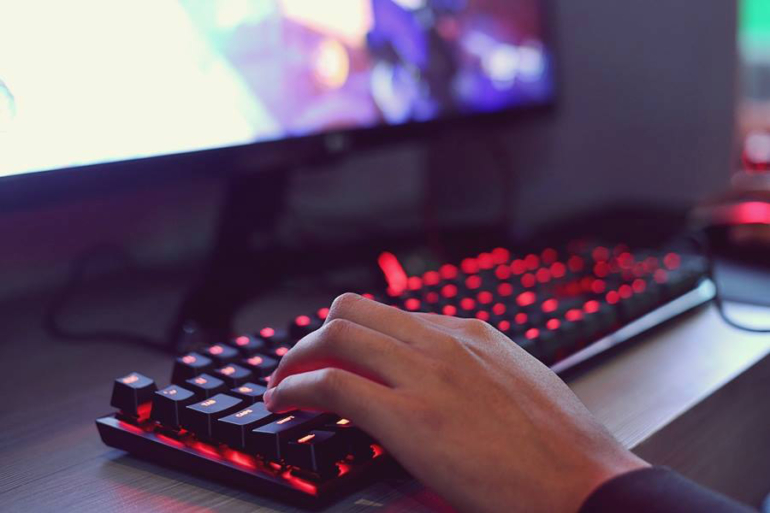 With a full numpad, three key switch options, sturdy construction, and a decent price, the HyperX Alloy is a great option for a number of gamers and esports enthusiasts. Plus, its detachable USB and cushy carrying case allow for maximum portability. Cons: Without dedicated media keys, those who want to multi-task—switching music and adjusting volume—during gaming sessions will have to use multiple key pushes, which isn’t ideal for some gamers. Minimal RGB lighting options may be a disappointment to gamers looking for complete control.